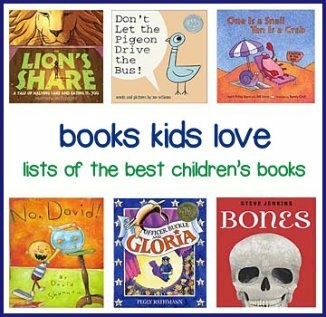 Teach Adverbs with Children's Books! For other parts of speech, visit our list of books for teaching language arts. 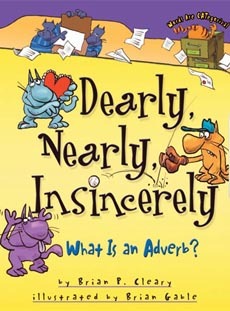 In this charmingly illustrated book, readers learn about what adverbs are and when and how to use them. For example, "Verbs tell us something happened. If you were an adverb, you could tell us how something happened. The snowboarder skied GRACEFULLY down the mountainside but he fell AWKWARDLY at the bottom." 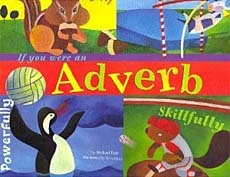 Includes a glossary, a game that helps teach adverbs, and suggested websites. Another hit in the Word Fun series. 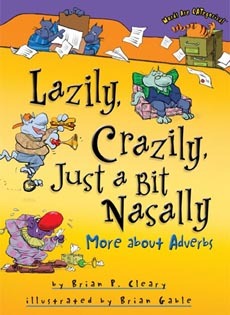 With the same liveliness and zaniness of their previous books, Cleary and Gable are back, this time to teach adverbs. Bouncy verses define adverbs ("Adverbs tell us when and how, / Like, quickly do your homework, now") and then give a seemingly endless list of examples which are printed in color to make them stand out from the text. School Library Journal said "The energy and sheer razzmatazz...will have young grammarians entranced." And Kirkus Reviews commended it for "...effectively explaining a potentially boring subject through a bouncy rhyming text filled with puns and jokes that will appeal to kids." The Words are Categorical series team is back with another "jolly treatment of the topic" (Booklist). 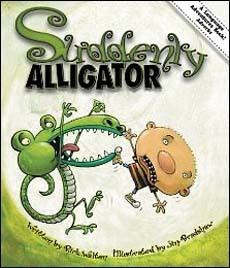 This book shows rather than just tells students what adverbs are and how to use them. As with its predecessor, this book features comical cartoon cats doing all manner of zany things. Rhyming verses are replete with adverbs that are color coded based on whether they convey when, where, how often... If you teach adverbs and are looking for lots of examples, this is a great pick! 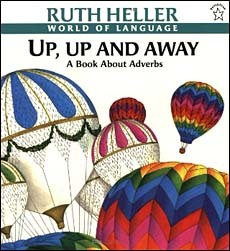 An introduction to adverbs, using bright, oversized illustrations, in Ruth Heller's trademark stye. 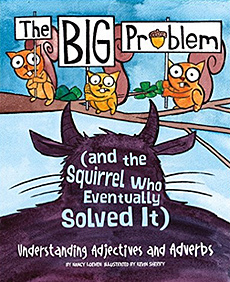 A lot of ground is covered in this book, from a basic introduction to adverbs all the way to superlatives, irregular adverbs, and double negatives." (Too much for one book? We're undecided). Fans of the World of Language series will definitely want this book as well. In their review, Booklist said "using expansive color drawings and catchy rhymes, Heller writes about words frequently and vividly and with an unmistakable flourish...A clever introduction." In The Big Problem (and the Squirrel Who Eventually Solved It), the squirrels have a problem. A BIG, POLKA-DOTTED problem. And they're watching NERVOUSLY, CURIOUSLY to see what it will do next. This goofy little story, complemented by informational back matter, is great to use if you teach adverbs and/or adjectives. This book is part of the "Language on the Loose" series. 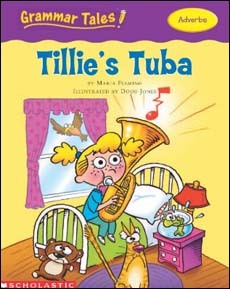 Tillie plays her tuba loudly. She plays her tuba proudly. She plays it early and late, day and night. Learn all about adverbs in this wacky tale about a girl and the tuba she just can't put down. Pages include small call-out boxes that help further teach adverbs -- what they are, how they are used to create great writing, and asks questions to check understanding. This book is part of Scholastic's Grammar Tales series of funny stories designed to help kids grasp the essential rules of grammar. These are actually really great resources for teachers! 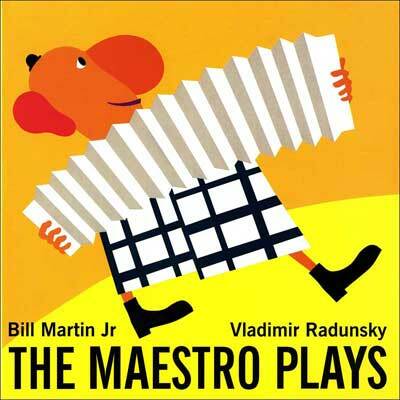 The Maestro Plays by Bill Martin Jr.
more books by Bill Martin Jr.